The newest version of the Reading Glove has recently been deployed in a set of user studies. 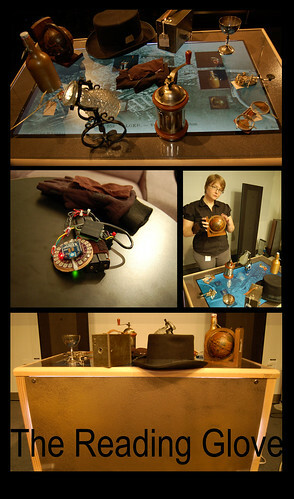 This version is augmented with a tabletop display that helps guide the user through the story. An intelligent reasoning engine generates recommendations based on the reader’s path through the objects, helping them out by filling in holes or pushing them to the next stage of the story. Via the user studies, we are investigating questions of adaptivity and the perception of artificial intelligence within an entertainment experience. We have been running user studies with the system at SFU-Surrey and are about to launch a new round at the Great Northern Way campus. Many thanks to our great participants at both schools for helping us complete this research! Our submission to UC Santa Barbara’s Bluesky Innovations Competition, which was themed around Social Computing in 2020 took 1st place! Our project envisions a world where mobile technologies have followed their current trajectory, further blurring the lines between online and offline spaces. Taking a page out of Corey Doctrow’s book we consider the possible implications that this trend will have on our ability to manage our privacy against our desire for digitally augmented socialization. Below is the award winning essay and the creative visualization that we designed to supplament it. The imagined social technology of SENSe (Socialization, Exploration, Negotiation, and Security) is a natural extension of two current trends in social networking: social presence and privacy concerns. It is evident that the growth in popularity of services like Facebook, Twitter, Flickr, and Google Talk and the parallel increase in mobile device usage are symptomatic of larger changes in the nature of social spaces, private spaces, and human interconnectedness. Already, we have seen how social networking supports the emergence of a form of ambient social presence. People now think nothing of signaling their receptiveness to phone calls by toggling a status indicator in Skype, while Twitter and Facebook allow users to periodically broadcast short status updates to their entire social circle. These updates and status indicators foster an “always‐on” sense of one’s social geography: what people are doing right now, minor incidents that occurred throughout their day, how they are feeling and what they are planning. Our new networked world supports the dramatic and the mundane in seamless concert. When disasters occur, these services support efficient real‐time coordination of rescue and relief efforts; when history is made,people around the world receive it in a thousand tiny haiku. If you see that a colleague is having lunch down the block you might join them for a bite to eat; if you see a friend is sad or angry about something you might call to offer comfort. The combination of distributed social broadcasting and pervasive mobile devices is a potent one that has already changed how we communicate in dramatic ways. It’s been a while since I posted anything here, not because it has been quiet following the thesis defense, but because things have not slowed down at all in the last three months. Today I’m taking a bit of time to catch my breath, and to catch this blog up on the newest scheme concocted in the labs of Team Tanenbaum. Karen and I have been tossing this idea back and forth since early in the summer, but have recently resolved to try and run with it in earnest (note the copious use of ball-game metaphors). Below, you will find two versions of the TUNE documents. The first is a section out of a recent grant proposal I wrote. It is focused on one aspect of my research within TUNE. The second is an extended description of the project, which encompasses both my and Karen’s interests more fully. My dissertation work is in the area of “user modeling for ubiquitous environments” and some days even I am not sure what that means. But I’ve been wrestling with it for about a year now, and I think I’m at the stage where I have a grasp of the basic idea and am beginning to get a handle on the areas of contention. In this post, I am attempting to formalize this knowledge as a way of doublechecking myself, and possibly getting some feedback on my understanding by showing the writeup to my supervisor and other interested parties. Let me begin by focusing on each of the components of the loaded phrase “user modeling for ubiquitous environments”. Oblivion Paper Rewrites, wave 1. Comments Off on Oblivion Paper Rewrites, wave 1.